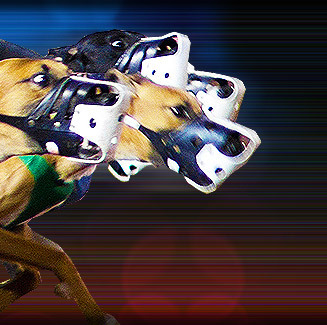 Considered one of Iowa's premier dog tracks, Dubuque Greyhound Park features live greyhound racing and simulcasting. Its location is idyllic since the facility was built on an island along the Mississippi river. Dubuque Greyhound Park also has a 6,500 square foot casino that features 600 slots. The property has three restaurants. Dubuque Greyhound Park is located on Highways 151-61 at the Dubuque/Wisconsin Bridge, Iowa, USA. Dubuque Greyhound Park opened in June 1, 1985. But a year earlier, the citizens of Dubuque, Iowa agreed to back the racetrack with a bond issue and stake their property tax dollars should the project fail. From the start, Dubuque Greyhound Park was an overwhelming success. The first class kennel roster included the likes of, The Discolo Kennel, The Connell Kennel, The Henry Kennel, The Nova Kennel and The Padrta Kennel. Dubuque Greyhound Park also had a stellar list of Trainers headed by then trainer of the year Stacie Castells. Dubuque Greyhound Park was the very first not-for-profit racetrack in the country, with all the profits earmarked for local charitable distribution. Dubuque Greyhound Park donated $2.87 million to various charities in 2004. Other jurisdictions closely watched the Dubuque Greyhound Park project. The customer relations standard set at Dubuque Greyhound Park were emulated by the greyhound racing industry. Dubuque Greyhound Park officials are often invited as speakers at industry conferences.